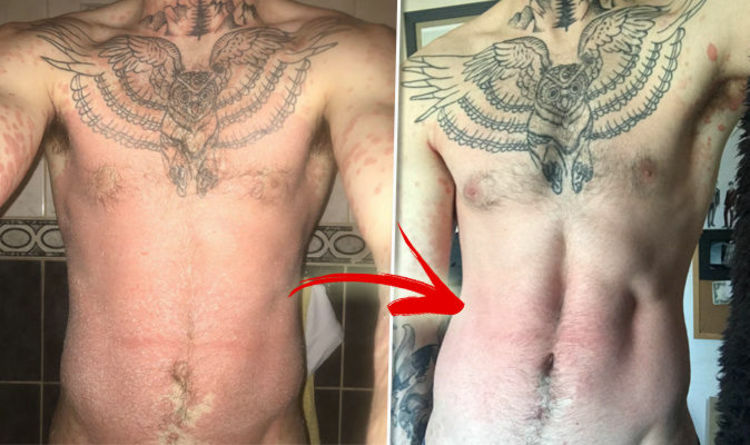 Damien Broderick, 26, suffers with psoriasis - a chronic skin condition that causes red, flaky, crusty patches of skin covered with silvery scales. Typically, psoriasis gets worse in the winter thanks to a change in termperature and other factors: here's six ways to relieve psoraisis symptoms this winter. Dublin-born blogger Damien had such strong flare-ups of the condition he would have to vacuum his clothing in order to clean up flakes of skin that would fall off his body. He previously used a steroid cream to treat the condition, but when the disease returned last month his GP advised him to look into alternative therapy. Damien tried everything from Chinese medicine to acupuncture - and as a last resort was advised to try Childs Farm products by a colleague. The blogger bought the Baby Moisturiser and Hair and Body Wash, and claims within days he started to see a visible difference in his skin. Damien said: “I was diagnosed with psoriasis when I was around 18 or 19. I just woke up one morning and I was covered in red spots. “I went to the doctor and was prescribed a course of steroid cream. "The cream got rid of it within about three months and I didn’t suffer with it again for seven years, but on the 20th October this year I woke up and I was covered again. “My torso and back were completely covered. From my thighs down to my feet it was just flaky red spots all the way down. “Whenever I removed a garment of clothing my skin would shed like snow. I had to get the hoover out when I took my clothes off. “My GP had advised against using steroid creams again and I was reluctant to try using sunbeds. I looked into acupuncture but it was too expensive, so a few of my colleagues advised me to try Childs Farm’s baby moisturiser and body wash after reading about the products online. “Within a few days of using the products I started to see a difference. My face cleared up first, then my neck, then my torso, and then my legs. It was as though it was making its way down my body. All Childs Farm products are made using naturally derived ingredients to produce mild products that care for the skin, hair and nails of newborns, babies and children, but the products are suitable for adults too. Childs Farm founder Joanna Jensen said: “We were thrilled to hear that our products have helped to make such a difference to Damien’s psoriasis. “Psoriasis is a debilitating condition that is difficult to treat, and it can have a huge impact on people’s confidence and quality of life. To hear that Childs Farm products are able to offer relief to this condition is fantastic. It comes after Express.co.uk revealed six ways to ease eczema and acne through the winter.